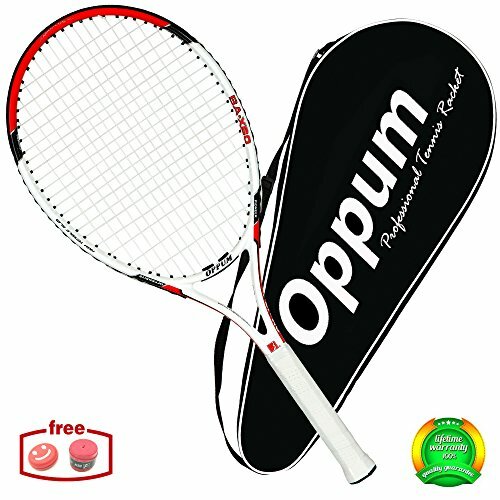 Oppum is a well-known brand that mainly sells sports products,has a long history, we are committed to develope more better new products, provide the best products to customers and to give customers the best consumer experience.Our racquets are made of carbon-aluminum composite with high strength. Lightweight frame design with high-elastic tube hardness to make racket with high flexible.Have one-piece design outside. It have been further improve the stability, achieve high-precision control performance. It also avoid the deformation caused by playing badminton, make racket more stable, play unparalleled power. And the tension of the string of the racket is also very large, the elasticity is good, and the strength is strong. We promise 100% guarantee product quality, If you satisfied our products, Please leave a Five-star Review and Feedback, thank you! Tennis Racket Grip size: 4 3/8, This Size Suitable for All Men and Women, Good Idea for Professionals and Beginners. 3. Carbon Fiber and Aluminum Metal Double-Mix Material: The racket frame is made of carbon fiber and aluminum metal mixed material, and the handle is wooden handle. The racquet face has a highly durable mesh belt, which improves the performance of the racquet and increases the strength and stability of the ball. Whether it’s the material of the racket frame or the paint on the outer layer of the racket, its quality and weight are very high, giving you a good tennis game experience. 5.Quality After-sales Service: This tennis racket is particularly affordable and the quality of the racket is guaranteed, especially for beginners and entertainers. You can use this racket with confidence, which can give you a good sports experience. If there are any quality problems with the racket, you can contact us. We have the best service team to solve all customer’s questions and problems.